Download via forum until 15 june after via download page website. I just installed the 1.2.2.1 x64 and the history files that show are for the 1.2.1.7 release. I'll install at work tomorrow. thanx for the left Monitor Fix. Filetransfer over a Slow Connection with high TCP Window is not working. this takes 16000/125= 128Sec -> "Filetranfer interupted: reason connection with server broken"
can the keepalive send every x kb too? 1. When connecting with a 1.2.2.1 client (and older clients) to a 1.2.2.1 server, there is an initial delay of 5-10 seconds on the 'password accepted' message. This delay did not happen with the previous 1.2.2.0 beta you provided (or earlier server releases). 2. Is there a way to disable the new keepalive functionality in the viewer? I often connect to iPhones via VNC and since they sometimes go 'dark' for a while when asleep, the new keepalive always closes it and I have to manually reconnect. With old versions without the keepalive, the connection would stay and simply resume when the phone came back alive on the wifi network. When viewer support keepalive, he tell the server he support it. The viewer send a small message to the server to keep the line open. The server answer to a keepalibe with hos own keepalive. The keep the communication open in both directions. Q2: Perhaps the keepalive is not the problem then. Something changed in 1.2.1.7 which made the viewer start to disconnect from the phone's VNC server constantly. In previous versions, this did not happen. In the new 1.2.2.1, it is still happening. I hope this can be resolved somehow. Thanks! can i set the FileTransferTimeout on the server > 30Sec too? Just tested the version from the first post (non-b-version): cursor-shape bug still exists. Is there a chance for a fix before official release? And a question: AddOns-Installation (UltraVNC_1_2_10_X64_Addons.exe) isn't needed anymore, correct? Looks like Encryption(DSM),schooks and w8keys are alreade included in Setup. Remains only one thing: AddOn-Installation for MirrorDriver-Setup on a Vista/Win7/2008R2 machine. Testing FT, but can't repeat it. On LAN with aThrottled network to 62k/s and transferred 640Mb ... took ages but file arived. Perhaps it's the repeater or just just some hop between server and viewer that breaks as the FT is flooding the network. Short test of c-version: CursorShapes are OK now! Thank you very much Rudi! Thank you very much Rudi for your work. File Transfer is very nice now. Especially the file transfer resumption in the case of unwanted disconnections. little improvement proposal for file transfer window: Could you enable copy and paste within the address bar, please? So it would be easy to copy long folder paths from or to the file transfer window. So this would minimize climbing tours through folder trees . Btw thank you for your hint with the mirror driver, but it didn't help. Have you another one? Therefore I have opened a separate thread. Trying v1.2.2.1c now ... .
-> "connection closed by peer"
With win7 the 2 monitors works well, but with Win10 1803 server I can't see the second monitor on server, it doesn't matter if is configured on left or right. If viewer and server has 2 monitors and both have the same resolution could be possible to work as full-screen, I tried but I could not make it work. FYI, I tried the new "c" beta version, set FTTimeout to 0 in the viewer options, and I am still getting the disconnects from the iPhone server when the phone goes to sleep. Again, this did not happen prior to 1.2.1.7. Thanks. Only paramter that can have an influence is keepalive =0 on server site. 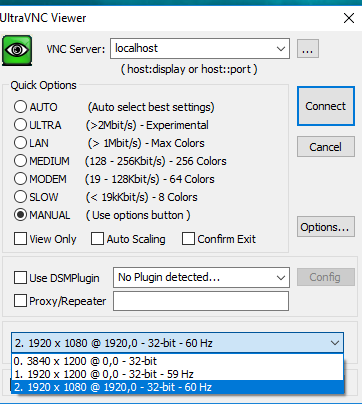 Settings it to 0 on server site disable it also on the viewer site. The keepalive change was added on request for the follwoing reason. 1) Keepalive is needed when you send a folder. *A folder is local zipped before sending and this take time, you need to send something to prevent a socket timeout. Kirck , multiple monitors are supported. 4) When you used monitor selection 0 ( viewer options on startup) the viewer is bound to the dual-monitor size. *quality >=7 remove almost all artifacts. We need to release tomorrow, else it gonna be Aug.
and don't get it done in a few hours. Many thanks for all your work and the release. The download page however seems to have some issues with the x86 MSI package as well as the source code package. Where do you enable the ddengine in the options? I see it in the Properties Window as being checked, but upon mouse-over the server icon in the system tray it doesn't show the ddengine like in your screenshot. On win10, you can remove schook and vnchook when the ddengine does it job you don't need them. File Transfer: Can't transfer files directly to admin folders, e.g. C:\Programm Files\... . WinVNC is runnig as service. I have to copy the files to the desktop instead. Via remote control I can copy the files then to C:\Programm Files\... Any Idea? Has it maybe something to do with the outsorced thread for file transfers since version 1.2.1.7? WinVNC remote control has privileged rights. File transfer window has only user rights. Last edited by Thomas Levering on 2018-06-19 08:59, edited 1 time in total. Hi! I've just updated to UltraVNC 1.2.2.1 and I found a little bug: in Properties, when I try to click "Check the Mirror Driver", the button disappears! This happens in all my machines (Windows XP, Windows 7 64 bit, Windows 10 64 bit). When i tried to upgrade from MSI 1.2.17 previouslly downloaded , i have an error windows "Unable to install because a newer version of this product is already installed". If i open the MSI with Installshield i can see that the "Product Version" is 1.2.16 instead of 1.2.21. I take a look for x86 version and "Product Version" is correct (1.2.21). I'm current onavailable to fix thing and answer questions. Back end of the month. Mr Wolf wrote: [...] in Properties, when I try to click "Check the Mirror Driver", the button disappears! - EditSettings.exe -> Screen Capture Tab -> "use mirror driver" checkbox is enabled; button "Check the Mirror Driver" says "1.00.23 driver Not Active"
- TipText of winvnc.exe while connected via vnc: "WinVNC - 192.168.x.x - PCNAME - service - schook"